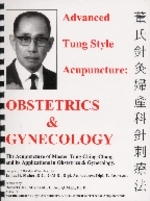 This, the second volume in the "Advanced Tung Style Acupuncture Series," addresses the application of Master Tung’s acupuncture in obstetrics and gynecology. Optimally, the reader will have already familiarized themselves with the basics of Master Tung's acupuncture, through coursework or reading material offered and compiled by his students. To reiterate, this text is not intended for use by the novice, but rather as a reference by those who already have a working knowledge of Master Tung’s Acupuncture. This text presents 522 pages of over 400 prescriptions gathered from the Chinese language Tung Acupuncture literature in the author's personal library. More than 15 different sources were referenced (several currently out of print). From these Chinese language sources, he has compiled, collated, and translated all the OB/GYN prescriptions proffered by the "experts" and has applied accompanying diagrams for each disorder/disease to facilitate their application. Included are author-specific point locations, needling instructions, contraindications and, when available, clinical comments, herbal suggestions, lifestyle modifications, etc. all derived from personal clinical experiences with Master Tung’s Acupuncture.